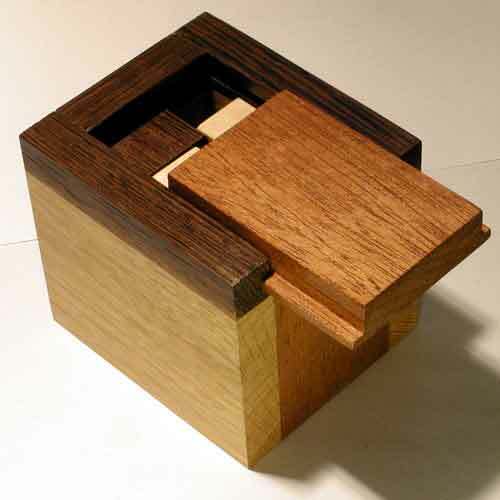 box:oak and wenge.Pieces: maple and wenge. A 6 piece packing.A very very difficult puzzle.The goal is to put the pieces in the box.I was inspired by Liu Suzuki "Stuffing"puzzle. The deference between this packing problem and others, is that you can not make it out of the box. That is because it has no design to remember,and also it has gaps between the pieces. The pieces are glued in such manner that they do not move in the box.No one has made so far that puzzle except for one person. He did it once in 10 minutes.I told him its beginners luck.So he took it seriously and he made it again after some... time,( i know you read that Simon). See more pics of the "Flatliner" puzzle.or Back to puzzle index.